Many thanks to Denis Mayne for sharing "The Irish Sword" document with us. This site is dedicated to the Coastguards who lived and worked around the Irish coastline between the 18th and early 20th centuries. It includes a collection of CG station photos as well as facts and figures about the people , births, deaths, census information, etc. I have also included some fascinating accounts of bravery during rescues from shipwrecks as well as interesting Extracts of shipwrecks and rescues, etc. If you have any queries or input, please let me know. The bulk of the content is available through the "Articles" link in the nav bar on the left or on the top menu. You can also avail of our Search facility and if you still can't find what you're looking for, you can always post your question on the Forum. N.B. You must be logged in to post in the forum, view the archives and other sections and facilities. R82, John Scott, Coastguard 1869. FIRE at CHEMICAL WORKS ARKLOW., Co.Wicklow. R3. The Rocket Apparatus. 2013. A Life Saving Device. The early use of the rocket apparatus involved the use of George Manby’s design for firing a 6lb. 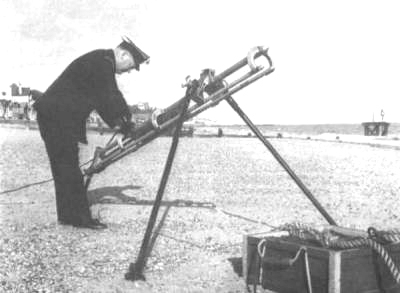 Mortar with a line attached across a stricken ship just offshore. E158. Suicide of a Coastguard. Midleton, Sunday.